The Court of Arbitration for Sport (CAS) will hear the cases of 39 of the 42 Russian athletes who have challenged the decisions taken by the Disciplinary Commission of the International Olympic Committee (IOC DC) in relation to the 2014 Sochi Winter Olympic Games. The IOC DC found the athletes to have committed anti-doping rule violations during the 2014 Olympic Winter Games, disqualified them from the events in which they participated in Sochi and forfeited all medals won by them. The athletes were also declared ineligible to participate in any capacity in all subsequent editions of the Olympic Games. A CAS procedure has been opened for each athlete. An arbitral panel has been constituted for the first 2 groups of procedures. 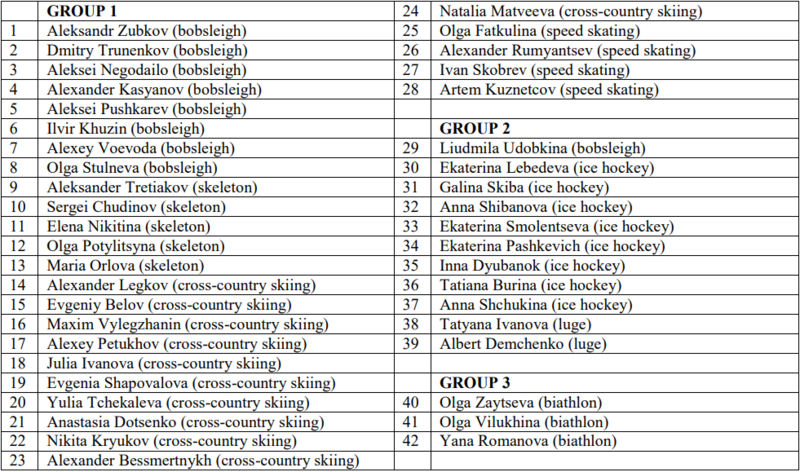 The cases in the 3rd group of procedures, involving 3 biathletes, have been suspended and will not be heard next week. The Panel for group 1 is composed of Prof. Christoph Vedder (Germany), President, Dr Hamid Gharavi (France) and Dr Dirk-Reiner Martens (Germany). The Panel for group 2 is composed of Prof. Christoph Vedder (Germany), President, Prof. Michael Geistlinger (Austria) and Dr Dirk-Reiner Martens (Germany). These procedures are being conducted jointly and a combined hearing will take place from 22 to 27 or 28 January 2018. The hearing will start at 9:30am on Monday, 22 January 2018. Due to the exceptional size of this hearing, it will be held at the International Conference Centre of Geneva (CICG). The hearing will not be open to the public. Dr Grigory Rodchenkov and Prof. Richard McLaren have been announced as witnesses but will not be present in Geneva. They are expected to testify by videoconference or telephone-conference. It is expected that the hearing will conclude in the late afternoon of Saturday, 27 January or possibly on Sunday, 28 January 2018. The date for the communication of the final awards is unknown at the moment but is likely to be between 29 January and 2 February 2018.